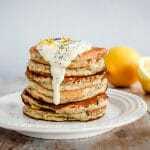 If you love lemon poppy seed muffins and pancakes then this will be the breakfast of your dreams. Heat a dry frying pan on a low heat. A small non-stick pan works best but use your first try to assess if you need to add a small amount of oil. Ladle approximately 1/4 cup of the batter onto the dry pan and cook for 20-30 seconds before carefully flipping onto the other side. Cook for another 20-30 seconds. Serve with some vegan yoghurt, extra zest or whatever other toppings you like and enjoy!